This entry was posted in rant n rave and tagged science fiction, teen lit by thelibrarina. Bookmark the permalink. 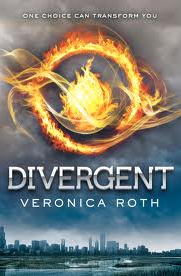 Yes, I really liked Divergent too, and wasn’t Dauntless one of the factions? What did you think of The Maze Runner Trilogy? I haven’t read the Maze Runner trilogy yet–somebody lost the library’s copy of the first book, so I had to order a new one, and I’m still waiting. It sounds good, so I’m looking forward to it!